The 4th Shore (in orange color in northern Libya), the southern part of Greater Italy, an Italian Fascist project to expand Italy's borders. The 4th Shore, in Italian Quarta Sponda, was the name created by Benito Mussolini to refer to the Mediterranean shore of coastal colonial Italian Libya and WW II Italian Tunisia in the fascist era Kingdom of Italy, during the late Italian Colonial Empire period of Libya and the Maghreb. The term 4th Shore derives from the geography of Italy being a long and narrow peninsula jutting into the Mediterranean with two principle shorelines, the First Shore on the east along the Adriatic Sea and the Second Shore on the west along the Tyrrhenian Sea. The Adriatic Sea's opposite southern Balkans shore, with Dalmatia, Montenegro, and Albania, was planned for Italian expansion as the Third Shore, with Libya on the Mediterranean Sea becoming the fourth. Thus the 4th Shore was the southern part of Greater Italy, an early 1940s Fascist project of enlarging Italy's national borders around the Italy's Mare Nostrum. After the Italian Empire conquest of Ottoman Libya in the 1911-1912 Italo-Turkish War, much of the early colonial period had Italy waging a war of subjugation against Libya's population. Ottoman Turkey surrendered its control of Libya in the 1912 Treaty of Lausanne, but fierce resistance to the Italians continued from the Senussi political-religious order, a strongly nationalistic group of Sunni Muslims. This group, first under the leadership of Omar Al Mukhtar and centered in the Jebel Akhdar Mountains of Cyrenaica, led the Libyan resistance movement against Italian settlement in Libya. Italian forces under the Generals Pietro Badoglio and Rodolfo Graziani waged punitive pacification campaigns which turned into brutal and bloody acts of repression, even as a consequence of many killings of Italian soldiers and prisoners of war since 1911. Resistance leaders were executed or escaped into exile. The forced migration of more than 100,000 Cyrenaican people ended in Italian concentration camps. After two decades Italy predominated. Afterwards Libya was predominantly 'Italianized,' and many Italian colonists moved there to populate Italian North Africa. The Italians in Libya numbered 108,419 at the time of the 1939 census (12.37% of the total population). They were concentrated on the Mediterranean coast around the city of Tripoli (constituting 37% of the city's population) and Benghazi (31% of the city's population). Libya was made an integral part of Italy in 1939 and the local population were granted a form of Italian citizenship. Tunisia was conquered by Italy in November 1942 and was added to the 4th Shore - Quarta Sponda - because of the large community of Tunisian Italians living there. Italo Balbo, the Governor of Italian Libya (1934-1940) responsible for modernization projects in the 4th Shore. 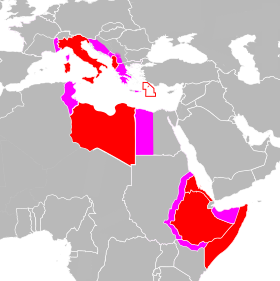 During less than thirty years (1912–1940) in Libya the Kingdom of Italy (in the territory that was called initially Italian North Africa (1912–1934) and later Italian Libya (1934–1940) or 4th Shore of Greater Italia) developed the cities and countryside with an enormous array of investments. They built huge public works, such as new town districts with streets and buildings, modern ports, the Italian Libya Railways, and long highways. The Libyan economy and trade flourished very much, similar to what happened during the ancient Roman empire colony era. Italian farmers cultivated lands that had returned to being native desert for many centuries. Even archeology flourished, with ancient city of Leptis Magna rediscovered and used as a symbol of the Italian right to recolonize the region. Libya was considered the "new America" for Italian emigrants of the 1930s. Indeed, in 1938 the governor, Italo Balbo (1934-1940), brought 20,000 Italian farmers to colonize Italian Libya, and 26 new villages were founded for them, mainly in Italian Cyrenaica. The 22,000 Libyan Jews were allowed to integrate without problems in the society of the 4th Shore. However, after the summer of 1941, with the arrival of the German Nazi Afrika Korps, they started to be moved into temporary internment camps within Italian Libya under Nazi SS control). Mussolini even wanted to assimilate the Islamic peoples of Libya, whom he called "Muslim Italians", and so in 1939 ten villages were created for Arabs and Berbers: "El Fager" (Alba), "Nahima" (Deliziosa), "Azizia" (Profumata), "Nahiba" (Risorta), "Mansura" (Vittoriosa), "Chadra" (Verde), "Zahara" (Fiorita), "Gedina" (Nuova), "Mamhura" (Fiorente), "El Beida" (La Bianca). All these new villages each had a mosque, a school, a social center with sports facilities and a cinema, and a small hospital. On January 9, 1939, the colony of Italian Libya was incorporated into metropolitan Italy and thereafter considered an integral part of the Italian state. The French, in 1848, had incorporated French Algeria in this manner. By 1939 the Italians had built 400 kilometres (250 mi) of new railroads and 4,000 kilometres (2,500 mi) of new roads. The most important and largest highway project was the Via Balbo, an east-west coastal route connecting Tripoli in western Italian Tripolitania to Tobruk in eastern Italian Cyrenaica. Most of these projects and achievements were completed between 1934 and 1940 when Italo Balbo was governor of Italian Libya, as it became the Fourth Shore. "...Once pacification had been accomplished, fascist Italy endeavored to convert Libya into an Italian province to be referred to popularly as Italy's Fourth Shore. 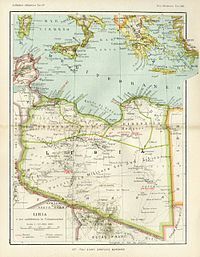 In 1934 Tripolitania and Cyrenaica were divided into four provinces—Tripoli, Misratah, Benghazi, and Darnah—which were formally linked as a single colony known as Libya, thus officially resurrecting the name that Diocletian had applied nearly 1,500 years earlier. Fezzan, designated as South Tripolitania, remained a military territory. A governor general, called the first consul after 1937, was in overall direction of the colony, assisted by the General Consultative Council, on which Arabs were represented. Traditional tribal councils, formerly sanctioned by the Italian administration, were abolished, and all local officials were thereafter appointed by the governor general. Administrative posts at all levels were held by Italians. An accord with Britain and Egypt obtained the transfer of a corner of the Anglo-Egyptian Sudan, known as the Sarra Triangle, to Italian control in 1934. The next year, a French-Italian agreement was negotiated that relocated the 1,000-kilometer border between Libya and Chad southward about 100 kilometers across the Aouzou Strip, but this territorial concession to Italy was never ratified by the French legislature. In 1939 Libya was incorporated into metropolitan Italy. During the 1930s, impressive strides were made in improving the country's economic and transportation infrastructure. Italy invested capital and technology in public works projects, extension and modernization of cities, highway and railroad construction, expanded port facilities, and irrigation, but these measures were introduced to benefit the Italian-controlled modern sector of the economy. Italian development policy after World War I had called for capital-intensive "economic colonization" intended to promote the maximum exploitation of the resources available. One of the initial Italian objectives in Libya, however, had been the relief of overpopulation and unemployment in Italy through emigration to the undeveloped colony. With security established, systematic "demographic colonization" was encouraged by Mussolini's government. A project initiated by Libya's governor, Italo Balbo, brought the first 20,000 settlers – the ventimila – to Libya in a single convoy in October 1938. More settlers followed in 1939, and by 1940 there were approximately 110,000 Italians in Libya, constituting about 12 percent of the total population. Plans envisioned an Italian colony of 500,000 settlers by the 1960s. Libya's best land was allocated to the settlers to be brought under productive cultivation, primarily in olive groves. Settlement was directed by a state corporation, the Libyan Colonization Society, which undertook land reclamation and the building of model villages and offered a grubstake and credit facilities to the settlers it had sponsored. The Italians made modern medical care available for the first time in Libya, improved sanitary conditions in the towns, and undertook to replenish the herds and flocks that had been depleted during the war. But, although Mussolini liked to refer to the Libyans as "Muslim Italians," little more was accomplished that directly improved the living standards of the Arab population." Plans envisioned an Italian colony of 500,000 settlers by the 1960s, according to historian Piero Maravigna: so, the Italians would be 2/3 of the population in coastal Libya by then. Libya's best land was allocated to the settlers to be brought under productive cultivation, primarily in olive groves. Settlement was directed by a state corporation, the "Libyan Colonization Society", which undertook land reclamation and the building of model villages and offered credit facilities to the settlers it had sponsored. In 1942, Tunisia was also included in the "Quarta Sponda" (with nearly 100,000 Tunisian Italians), but a few months later it was occupied by the Allies. Indeed, it was in November 1942 that Italian troops occupied (with Rommel's help) Tunisia and seized it from the Vichy regime. Tunisia administratively was added to Italy's Quarta Sponda and united with Libya, in the last tentative attempt to realise Mussolini's project of Imperial Italy. Some Tunisian Italians participated in the Italian Army, but in May 1943 the Allies conquered all Tunisia and the French authorities closed all the Italian schools and newspapers (in order to erase the possibility of a new Italian 4th shore in future). ^ Moore, Martin (1940). Fourth Shore: Italy's Mass Colonization of Libya African Affairs XXXIX (CLV), 129-133. Mezzetti, Ottorino. Guerra in Libia – esperienze e ricordi, Cremonese Editore, Roma 1933. This page was last edited on 20 January 2016, at 16:57 (UTC).